Cleveland Browns rookie quarterback Baker Mayfield (6) is confident Oklahoma coach Lincoln Riley (right, front) is ready to make the jump to the NFL level. Cleveland Browns rookie quarterback Baker Mayfield is confident Oklahoma coach Lincoln Riley is ready to make the jump to the NFL level. BEREA, Ohio -- Since the Cleveland Browns dismissed coach Hue Jackson and offensive coordinator Todd Haley on Monday, October 29, there has been no shortage of speculation on who will be the team’s next full-time head coach. 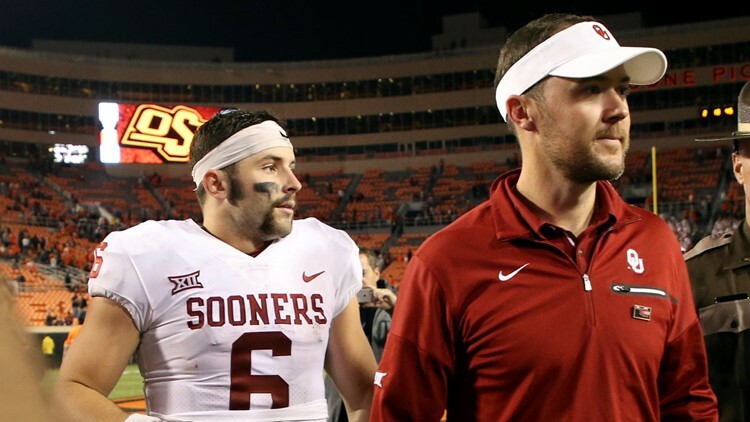 University of Oklahoma coach Lincoln Riley has been one name bantered about because of his connection to quarterback Baker Mayfield, and the Browns’ No. 1 overall pick in the 2018 NFL Draft is confident that should his former coach make the jump to the NFL level, he will find success. Oklahoma Sooners quarterback Baker Mayfield (6) hugs head coach Lincoln Riley after the Big 12 Championship Game against the TCU Horned Frogs at AT&T Stadium in Arlington, Texas. In two years at the helm of the Oklahoma Sooners, Riley has compiled a 24-3 record (.889 winning percentage) with two Big 12 Championship Game victories and a pair of selections to the College Football Playoffs. Riley was 12-2 during his first season with the Sooners (2017) and is 12-1 heading into their Orange Bowl semifinal matchup against the No. 1 team in the country, the undefeated Alabama Crimson Tide. “You have to have that same standard that you live to be the same person each day, and that’s what the great ones do and that’s what Urban (Meyer) did consistently for a long time and that’s what Lincoln does right now,” Mayfield said. 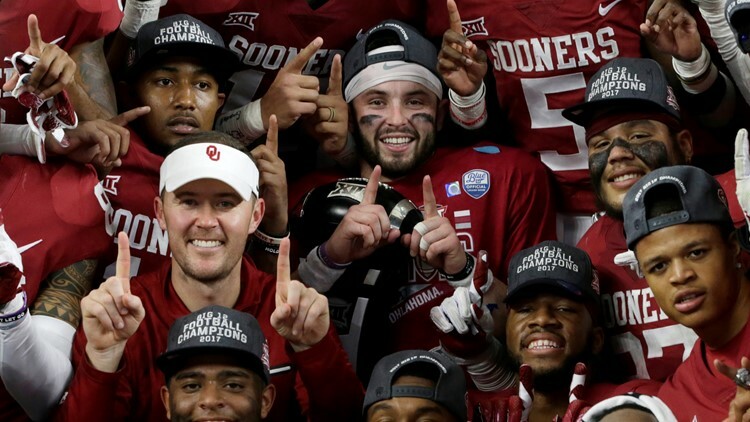 Oklahoma Sooners head coach Lincoln Riley and quarterback Baker Mayfield (6) pose after winning the Big 12 Championship Game against the TCU Horned Frogs at AT&T Stadium in Arlington, Texas. Unwilling to say whether or not he wants Riley to become the Browns’ next head coach, Mayfield believes Riley would be one of the few coaches to turn a successful college career into great things at the professional level. “To me, after being here, it’s about respect,” Mayfield said. “You get a locker room full of guys that are making a lot of money, obviously, the egos are going to be there. You have to have the respect in guys.